People ask me why they get the error “Could not receive data from google (Err: blocked IP)” on Squirrly > Performance Analytics page. This error means that Google is blocking the calls from your IP over the next hour, because there are too many rank checks. (coming from your server’s IP). 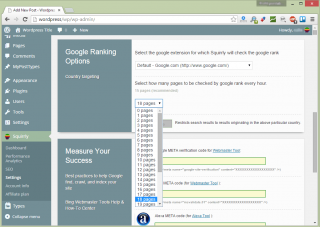 Your IP (the IP address of your WordPress host) makes too many calls to Google. This does NOT happen due to Squirrly. As you can see in the interface, you can set the interval for how to ask google about the Google Rank (the SERP). Now: maybe you have a shared IP and multiple websites or web apps are hosted on the same server (this is something that happens quite often. You should ask your hosting provider). If this is the case, then maybe those sites ask Google for information as well. Google has kept limiting the number of requests it wants to receive from people. Even if you’d search manually on Google, it would start blocking you at one point. What does it mean: IP Blocked? Does it Affect me? No, it does not. It has 0 (zero) impact on search rankings and whatnot. It simply means that Google refuses for a while to “chat” with the IP address from which you send the requests. How Do I Fix This? What are the Solutions? 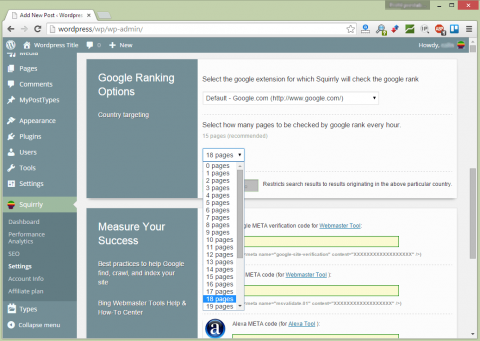 2) SERP Checker Plugin by Squirrly. Read how this helps. As the On-page SEO from Squirrly, the See Google Rank feature is also FREE and uses Google search results to get the position for each article. While using Google search option, you are limited (By Google, not by us) as to how many articles you can check every hour. For this, we added an option in Squirrly 5.0 or higher to set the number of article you want checked each hour. We recommend to set it to 5 articles per hour to prevent Google from blocking your IP for the next hour. If you have your site hosted with shared hosting, the server IP is used by many other users. In this case, even if you have 0 calls for Ranking in Squirrly > Settings > Rank Option, the IP can be blocked and we encourage you to buy a private IP . SERP Checker plugin doesent work best for my site and the Squirrly Analytics sometimes work and sometimes doesent 🙁 But, I love the plugin overall. I’m getting an error: To be able to check the RANK please set the “open_basedir” to NULL on your server. I see in the code that if open_basedir has any value other than blank I will receive this message but why would you need to insist on this potentially dangerous setting for a simple cURL request? Looking slightly close at the code, the open_basedir check is the last in a sequence of checks to determine why the setting `sq_google_ranksperhour` might be above zero. Is this absolutely the only possible reason for this as I’m reluctant to disable the security benefits of open_basedir. I tried posting the commands to fix this but cloudflare blocked me. Basically – disable wordpress internal cron – switch to OS cron and also set ipv4 to a higher precedence so you resolve google over IPv4 and you should be unblocked or have fewer chances of getting blocked.